Continue with this section to learn more about the addition of Microsoft SharePoint databases to the application scope manually. 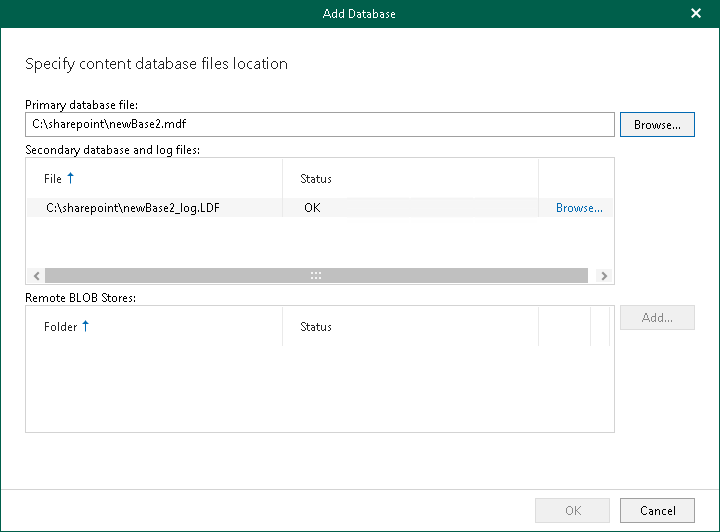 When you add standalone Microsoft SharePoint databases to the application scope, Veeam attaches such a database to the staging SQL server, creating a temporary Microsoft SharePoint content database from which you can recover your items. Click Add Database > Microsoft SharePoint Databases on the toolbar or right-click the root Database node and select Add database. Specify the location of the Microsoft SharePoint primary content database file (.mdf). The secondary database and the transaction log file (.ldf) will be added as well. To add remote BLOB stores, click Add next to the Remote BLOB Stores section.